Here we are gonna take a quick look at the upgrades available for the various LANCE vehicles! 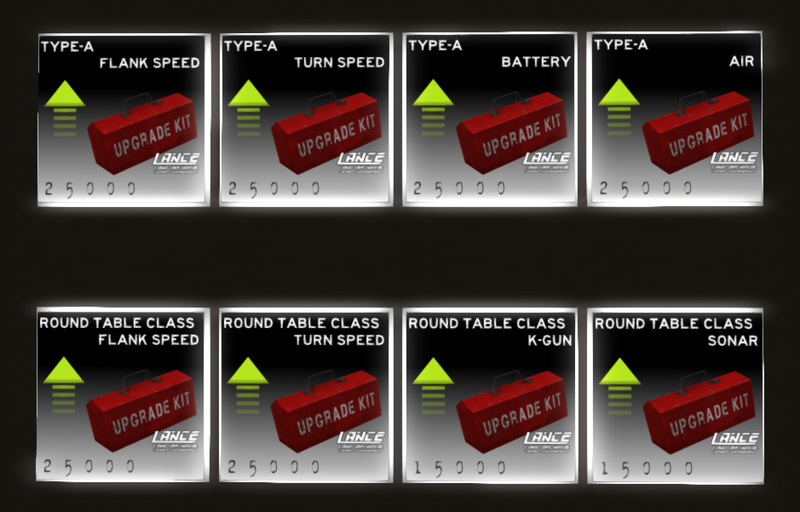 Remember, you need to have the upgrades attached to use them! Flank speed upgrade: This will upgrade the speed of your freighter, especially noticeable on flank speed. Turn speed upgrade: This will upgrade the turning speed of your freighter, handy for maneuvering. 5inch gun upgrade: This will enable you to use a 5inch cannon for basic self-defence! Flank speed upgrade: This will upgrade the speed of your round table, especially noticeable on flank speed. Turn speed upgrade: This will upgrade the turning speed of your round table, handy for maneuvering. K-gun upgrade: This will equip additional depth charges launchers, allowing you to launch more depth charges at the same time! Sonar upgrade: This will give you a sonar to help gauge submarine target location to allow for a more calculated depth charge drop. Flank speed upgrade: This will upgrade the speed of your Type-A, especially noticeable on flank speed. Turn speed upgrade: This will upgrade the turning speed of your Type-A, handy for maneuvering. Battery upgrade: This will upgrade the battery, allowing for longer underwater time! Air upgrade: This will upgrade the air tanks, allowing for longer underwater time! Flank speed upgrade: This will upgrade the speed of your S-18, especially noticeable on flank speed. Turn speed upgrade: This will upgrade the turning speed of your S-18, handy for maneuvering. Flank speed upgrade: This will upgrade the speed of your T2 Tanker, especially noticeable on flank speed. Turn speed upgrade: This will upgrade the turning speed of your T2 Tanker, handy for maneuvering. 5inch gun upgrade: This will enable you to use a 5inch cannon for basic self-defence. 20mm gun upgrade: This will enable you to use machine guns for self-defence.